Norfolk State University, Hampton University, Howard University and Elizabeth City State University are joining together on the campus of NSU for an HBCU choral festival on February 28. 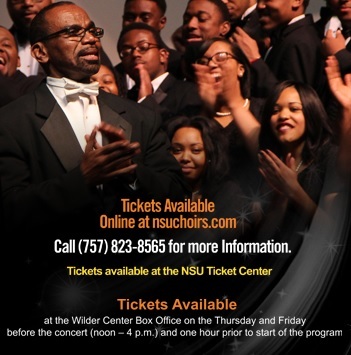 On Feb. 28, Norfolk State University will be hosting a HBCU choral festival. The festival will began at 5 p.m. in the L. Douglas Wilder Performing Arts Center. Tickets are available at the NSU Ticket Center as well as online at Nsuchoirs.com. Tickets purchased before the concert are $20 for adults, $10 for students and $10 for children. Any tickets purchased on the day of the concert will be five dollars higher. For last minute entry, tickets will continue to be available one hour prior to the start of the program. Children under eight are not allowed to attend the festival. Hampton, Howard and Elizabeth City State are other universities participating in the HBCU choral festival. This concert will certainly provide the opportunity for individuals to hear a collection of talented students as they perform. “Individuals will leave with musical fulfilment knowing that what they have heard has been inspiring and a testament to the musical achievement of the choirs,” Haywood said. Don’t miss the opportunity to experience a live HBCU choral festival performed by multiple HBCUs on Feb. 28. Tags: choir, choral festival, concert, Elizabeth City, Hampton University, HBCU, Howard University, Norfolk State, NSU. Bookmark the permalink.